It is functional replacement for MQTT Distributor Module for larger scale deployments with use of the Inductive Automation Ignition Platform. Like the Ignition platform, it comes with a two hour re-settable trail period. 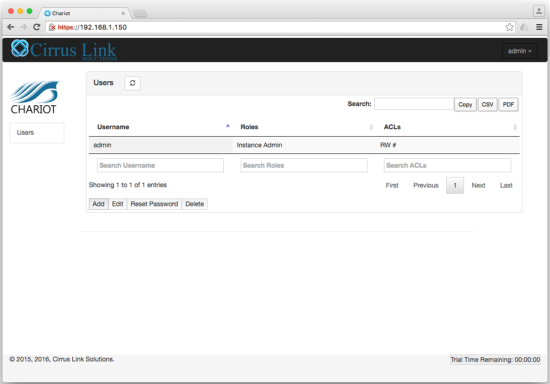 It can also be set up with a license key from Cirrus Link to enable it permanently once purchased. To try the free trial of the Chariot MQTT Server software and tutorial go here! The MQTT Distributor Module is an MQTT server, compliant with the 3.1.1 MQTT protocol OASIS standard. It enables MQTT clients to securely connect, publish, and subscribe data, supplying data to both operational and business applications throughout the enterprise. The MQTT Distributor module comes in two versions, Distributor and Distributor Plus. Standard Distributor supports up to 50 simultaneously MQTT Clients and Distributor Plus supports up to 250 for larger installations. 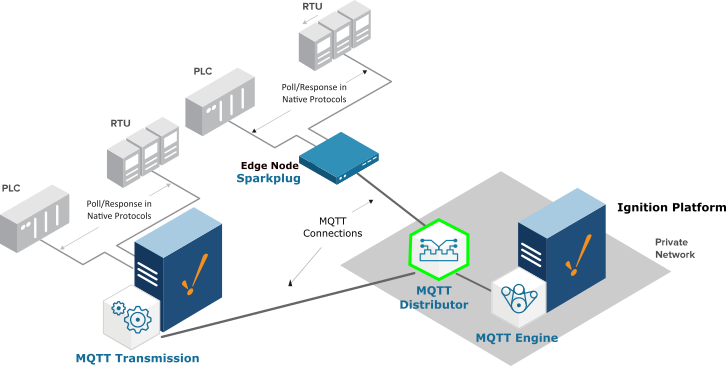 Enabling MQTT Distributor in conjunction with the MQTT Engine Module provides the components for a self-contained MOM infrastructure from one Ignition gateway. This combination delivers the requirements for IIoT solutions and wide-area SCADA applications such as oil and gas pipeline controls solutions. It is ideal for situations where there are restricted or high-cost communications such as in VSAT or cellular connectivity. This solution is also highly effective for increasing the data throughput for high-performance plant-floor solutions. The MQTT Distributor Module is available as a Standalone Module. It can be purchased as a Standalone MQTT Server not needing an Ignition license making ideal for distributing one or more MQTT Distributor Modules for scalability, redundancy and diverse location applications to increase reliability. For tutorials and support, please go here.